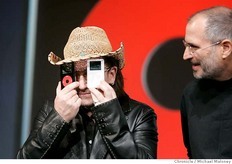 U2 iPod (looks pretty cool!) and iPod Photo. I can't wait to check them out in person. Apple and U2 are going to make an announcement next week at San Jose's supercool restored California Theatre. Will there be a special U2-edition black iPod? How many songs will it hold: uno, dos, tres, catorce? I'll be signing books this Saturday, Oct. 16th, at Brentano's Books at Valley Fair Mall in San Jose, from noon to 4 PM. Come on by and say hello! It's right down the mall from the Apple store! John Rizzo will be there to sign our book Mac Toys. Mmm...donuts! Is there nothing they can't do? Microsoft CEO Steve Ballmer told a conference yesterday that "The most common format of music on an iPod is 'stolen'." Maybe he forgot that the vast majority of iPod users he just insulted are also his customers (for Windows or Office). And I doubt his statement is backed up by any of Microsoft's usually comprehensive research. No doubt Steve will be issuing a clarification soon.